"This set is functional, attractive, and oh-so-comfy." "Combines kid-friendly comfort with a touch of sophistication." "Features athletic imagery in a traditional patchwork pattern." "It perfectly captures one of the most beloved Disney movies." "Loaded with sweet illustrations of tents, trees, and friendly bears." "Has full-size images of your kid’s favorite Disney princesses." "Aquatic-themed design is kid-friendly, but not overly childish." If you’re looking for a set of quality bedding that’s functional, attractive, and oh-so-comfy, the Mainstays Plaid Bed is our top overall pick. Available in three colors (blue, white, and gray), it has a classic look that’s relatively gender-neutral, making it ideal not only for parents but grandparents who might have multiple kids visiting and staying over for the night. With a comforter, flat sheet, fitted sheet, pillowcases, sham, and bed skirt, it has everything you need to pull your kids’ room together. 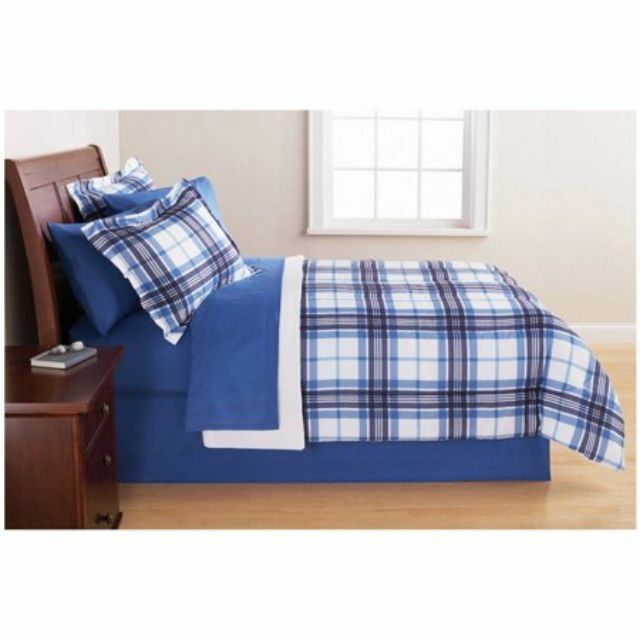 Even better, the comforter and sham are reversible (with plaid on one side and a solid color on the other) which will allow kids to further customize their bed. Customers write that this is the perfect bedding set at the perfect price. The colors stay bright wash after wash, and the sheets and comforter are ultra soft. It doesn’t necessarily need to be used for your kid's bedding either—the set can be purchased for twin, full, king, and queen mattresses. This stunning bedding set from Better Homes and Gardens combines kid-friendly comfort with a touch of sophistication. Dotted with large, handcrafted “flowers” made of ruffled fabric, this is one piece of kids’ bedding that would look right at home in a magazine spread. The set includes the comforter as well as two standard pillow shams (which also feature the floral design) and is made of high-quality polyester. And while the price point is slightly higher than some of our other picks, it’s a beautiful print that older kids will love. Customers write that the color and quality of the Better Homes and Gardens Ruffled Flowers set are terrific, saying the soft pink material is gorgeous and subtle—not “bubblegum” at all. If your kid loves feeling like a princess but is a little too old for Disney-themed bedding, this set might be the perfect option. It's also available in a full and queen size. If you’ve got a little sports lover in your life—boy or girl, let’s be honest—then the Mainstays Kids’ Sports Patch Coordinated Bed in a Bag brings all the excitement of the court or field into their own bedroom. This bold pattern features soccer balls, basketballs, baseball bats, and other athletic imagery in a traditional patchwork pattern. True to its “bed in a bag” moniker, this set includes a comforter, standard pillow sham, flat sheet, fitted sheet, and a pillowcase. Made of polyester microfiber, this bedding set is super comfortable and totally soft. Customers love that the variety of colors in the pattern make it easy to coordinate in just about any room, while the array of basketball, football, hockey, baseball, and soccer memorabilia means your kids won’t outgrow it as they try out different sports over the years. Here’s another great bedding set for the Disney-obsessed kid, with a full-scale illustration of Anna and Elsa, the sisters from the studio’s smash hit Frozen. It perfectly captures one of the most beloved Disney movies of the past decade, and also has soothing pastel colors and floral, Nordic-inspired designs along the edges. Available in twin and full sizes, the set includes a comforter, flat sheet, fitted sheet, and pillowcase (which also features Elsa). The Disney’s Frozen Nordic Frost set is 100% polyester, and makes a great gift for any kid who’s worn out their Frozen DVD. Customers write that the bedding is high-quality and very comfortable—the sheets are surprisingly silky. If the kid in your life can never get enough Frozen, this is the bedding set for them. This camping-themed bedding set from Mainstays Kids is so adorable we wish it came with a roll of matching wallpaper. The pattern on the comforter is loaded with illustrations of tents, trees, and friendly bears, while the sheets and pillows feature an arrow pattern that adds a vintage touch. The colors are largely muted blues, oranges, and greens, making it easy to match with existing decor, and the polyester microfiber construction is comfortable and soft. Another “bed in a bag” product, the Mainstays Kids Camping set includes a comforter, fitted sheet, flat sheet, sham, and a standard pillowcase, and is also available in twin and full sizes. Customers write that it’s “cute, cute, cute,” with a pattern that’s sure to delight any lover of the great outdoors. Looking for another great option for kids who love Disney characters? This Disney Princess 3-Piece Flannel set, which features bright illustrations of Rapunzel and Belle along with some inspirational words to spur their imaginations, is a great option. Made of 100% polyester microfiber, this set includes a fitted sheet, flat sheet, and one standard size pillowcase. The pillows are especially eye-catching, with full-size images of your kid’s favorite Disney princesses—so they can pretend they’re in Beauty and the Beast every time they go off to sleep. Customers say these Disney sheets are bright, soft, and colorful. They’re an instant hit with any Disney-loving kid—just be aware that the “flannel” in the product’s name is a bit of a misnomer, as the sheets are polyester and not cotton. Still, it’s a fun and comfortable bedding set that will instantly Disnify any kids’ room. If your kids are growing out of ultra-bright colors and animated characters, this bedding set from Better Homes and Gardens is the perfect next step. Its aquatic-themed design is kid-friendly, but not overly childish, with a simple illustration style that wouldn’t look out of place in a children’s book aimed at a slightly older age group. The varying shades of blue keep it on the neutral side, but we love the starfish and coral that add bright pops of color here and there. The twin set includes a comforter, sham, and decorative pillow—the sheets aren’t included). It can also be purchased in full and queen sizes with a second set of pillows. This polyester bedding set earns raves from buyers, who say it feels much higher quality than you’d expect at this price point—there’s even embroidered stitching on the decorative pillow. It’s also decidedly gender-neutral, making it a great pick for grandparents or other family members who want to set up a separate room for visiting kiddos. Our writers spent 4 hours researching the most popular kids bedding from Walmart on the market. Before making their final recommendations, they considered 25 different bedding overall, screened options from 10 different brands and manufacturers and read over 25 user reviews (both positive and negative). All of this research adds up to recommendations you can trust.